Please note that the Courses and Modules listed on the above mentioned three pages will be updated in spring 2012. By then, the PharmaTrain courses will be taken from the “On-Course” data base developed by the partner project “EMTRAIN”, one of the other five IMI JU “Education & Training (E&T) Projects. Modules usually have assessments at the end of the Module. An Elective is defined as a module which can be used to complete the Masters Degree i.e. in addition to the Extension Modules (Extension Master) or as part of the Integrated Masters Programme. An Elective can be passed as one of the 12 mandatory modules to achieve a Masters Degree. PharmaTrain will work on a defined list of Electives (WP3 and 6) which are well characterized in terms of Learning Outcomes and content. Course Providers may choose Electives for recommendation. The PharmaTrain CPD-Platform for Continuing Professional Development (CPD) includes elective and extension modules and stand-alone modules provided by PharmaTrain to facilitate lifelong learning. CPD modules are provided by universities but also from Learned Societies within PharmaTrain. CPD platform is available with approx. 100 products provided by the PharmaTrain partners on www.pharmatrain.eu. The topics of the Syllabus have been allocated to the above mentioned Modular Structure (definition of the Curriculum Structure) and in the next step Learning Outcomes have been defined for all modules (8-15 Learning Outcomes / Module). Modular Learning Outcomes have been defined for the Base (Diploma) Course Modules and Extension Modules. Further Learning Outcomes will be defined for the list of Electives. Assessments include modular assignments. After the end of each module of the Base (Diploma) Course and Master Programme assignments have to be passed ((keywords: data set, critical analysis, review, “scenario based”, “ ECTS). Integrated Examinations are held after the end of the programmes (keyword: written paper, MCQ). This “Implementation Process of Shared Standards” has been created to have a defined process in place which allows Course Providers (Diploma Base Courses and Master Programmes) to demonstrate the change of their courses and inclusion of PharmaTrain standards. In addition, courses which have awarded Center Recognition or Center of Excellence will be considered by EFPIA companies for additional course fees sponsorship as in-kind contribution. The Implementation Process of Shared Standards is based on the concept of site visits of assessors at all course sites. If they feel prepared Course providers “call” the assessors trio teams for either a coaching or an assessment to, finally, achieve the Award as a Center Recognition or directly a Center of Excellence. To achieve these PharmaTrain stamps the Implementation Process of Shared Standards for new and adapted training programmes. The PharmaTrain e-library integrates state-of-the-art newly developed blended learning modules with those collected from continuing survey to create a directory of online courses. The library is open to all partners, allowing them to blend the content into their modular courses in the way best suited to their institution. The repository will allow institutions to continue to develop more specialised extension modules, enhancing the learning experience by creating a holistic environment of teaching methodologies supporting the programme. In addition, this repository will evolve into a pan-European online e-campus, supporting faculty and students. Supporting material (e.g. book chapters, publications etc.) will be added and become part of the online repository. The following e-learning modules have been developed during the IMI PharmaTrain project ending April 2014. They are covering the medicines development process. The compact modules are linked to the PharmaTrain base courses in Pharmaceutical Medicine/Medicines Development science and can be used as a preparation before face-to-face sessions or as post-session reading. here. PharmaTrain is fully based on the Bologna process, which is well established in Europe. PharmaTrain uses the European Credit Transfer and Accumulation System, ECTS: 1 ECTS = 25-30 student investment hours. An Elective is defined as a module which can be used to complete the Masters Degree. PharmaTrain will work on a defined list of electives which are well characterized in terms of learning outcomes and content. Course providers may choose electives for recommendation. The PharmaTrain CPD-Platform for Continuing Professional Development (CPD) includes electives, extension modules and stand-alone modules provided by PharmaTrain to facilitate lifelong learning. In addition, PharmaTrain will identify and recommend high quality CPD modules from a variety of course providers. The CPD courses can all be found on www.pharmtrain.eu. Please note that in 2012 the PharmaTrain courses and modules will also be available in the on-course catalogue developed by the partner project “EMTRAIN”, one of the other five IMI JU “Education & Training (E&T) Projects. on-course will be the most comprehensive biomedical and medicines research and development postgraduate course portal in Europe. Extension Master Programme: six universities provide a postgraduate diploma consisting of 6 Base Modules including an Introductory Module (30 ECTS). By completing an additional six Elective Modules and a Master thesis a successful student will achieve a Masters’ degree (60+ ECTS). Integrated Master Programme: six universities and colleges provide a master programme with a continuity of modules and a Master thesis (60+ ECTS). Modular Structure: most of the institutions are constructing comparable modules aligned with the Bologna process with Learning Outcomes which are assessed to facilitate pan-European mobility. The PharmaTrain Syllabus: a list of topics comprising a subject, discipline or specialty field. Based on the IFAPP Syllabus for Pharmaceutical Medicine PharmaTrain has extended and adapted the syllabus to form the PharmaTrain Syllabus, V1.0, 2010. This Syllabus has been transferred into the Diploma (Base) Course and Extension Modules (section 3) and the modules for the Integrated Master programme. The Curriculum is the guideline to transfer the content of the Syllabus into the modular structure and is a statement of the aims and objectives, content, experiences, outcomes and processes of a programme, including a description of the structure and expected methods of learning, teaching, feedback and supervision. The curriculum sets out what knowledge, skills, attitudes and behaviours the trainee will achieve (see Learning Outcomes, below). Learning Outcomes are statements of what a student is expected to know, understand and/or be able to demonstrate after completion of a process of learning. These are the guiding principles for the development of the curriculum and each module, enabling mutual recognition between different institutions across Europe. The Modules within the Diploma (Base) Courses and Master Programmes are assessed by Modular Assignments provided by the different Universities. There are a variety of approaches that test different aspects of the learning experience. The following paragraphs described some of these different approaches. The course provider will select one or more approach that is appropriate to each module. Students are asked to undertake a critical review of a published paper, which covers a topic from the module. For example, if dealing with a clinical trial, the critical appraisal should include study objectives, design, and description of primary endpoint, power calculation, subject disposition, analysis, discussion and conclusion and the relevance of the paper for clinical practice at local / national level. Commentary pieces on drug development or regulation or drug safety issues may also be included here and the student asked to comment on the validity of the argument and the relevance for pharmaceutical medicine etc. Students are asked to present an analysis of a topic covered in the module and to discuss the impact of this on the process / practice of pharmaceutical medicine / industry/regulation etc. They will be expected to undertake a literature search on the topic and to provide arguments, backed up by relevant references, for their opinions. Examples of this type of assignment include an evaluation of a therapeutic area (e.g. a specific orphan disease) or an analysis of new R & D tools (e.g. genotyping). Students are asked to review and comment on a recent activity relating to one or more pharmaceutical companies/pharmaceutical industry in general. Examples would include review of research pipelines based on published data (comparison between companies), the future of R & D in general, impact of recent regulatory changes / voluntary codes of practice on the industry at local and international level, etc. Students should be expected to be able to analyse datasets, particularly relating to studies from each section of the R & D programme and from drug safety issues. In this type of assignment, students will be presented with a set of data and asked to describe what the data are telling them and how it will inform the future development / continued usage of the product and e.g. how it will contribute to / change the content of the target product profile. It is reasonable to expect students to have a general understanding of public health issues as they might affect the pharmaceutical industry, especially if they might impact on health technology assessments. Questions involving such concerns are a good way of testing the broad understanding of students about the overall environment within which the pharmaceutical industry operates. The term dissertation or thesis refers to the same endeavour, which is to present evidence that demonstrates that the student has grasped the essential elements of planning, researching, writing-up, and presenting the results and conclusions of a project that they have undertaken. This would normally be the end product of an MMD/MSc course and in most institutions a degree would not be awarded without this. Planning. The students should be able to demonstrate that they have thought through what they are planning to do. This is often achieved by writing an abstract and presenting this to their supervisor for the project. It should define the research question that they are asking and how they are going to approach obtaining the data and analysing them. Research. This will vary widely in nature and could consist of a study that the students are doing as part of their normal work. In this case it will be necessary for them to demonstrate what their role was in the project such that they had influence over the way the study was conceived and executed. They will need agreement from their employer to use the research study for the purpose of dissertation. An alternative could be a literature-based project. In this case it is of particular importance to ensure that the research question is carefully framed and is not simply an extended essay. Writing-up. This is the end-product of the project and will be the basis on which the examiners will determine if the student merits a pass. It will also be the document that is filed in the institution’s archives. Writing-up will include a statement about the research question, the way the research was undertaken, how the data were analysed and what the results and conclusions were. Where appropriate, write one or two papers based on the research that can be published in peer-reviewed journals. Management of the project should rest entirely with the institution at which the student is registered. This will include the appointment of supervisors, the resources made available to the student and the style and presentation of the project. Some institutions will insist on an oral discussion/examination of the project and others will only ask for this under defined circumstances. Write up the project in a logical and readable way. As with all assessments, the dissertation should be marked independently by two examiners who will focus on the ability of the student to analyse, synthesise and evaluate the topic. An oral defence may be required. An external expert in the field may be approached for comment and an external examiner will moderate the marks. Specified corrections should be completed within a defined time frame and verified by one of the examiners. Why do we need it in PharmaTrain? This “Implementation Process of Shared Standards” has been created to have a defined process in place which allows Course Providers to demonstrate the change of their courses and inclusion of PharmaTrain standards. In addition, courses which have awarded Centre Recognition or Center of Excellence will be considered by EFPIA companies for additional course fees sponsorship as in-kind contribution. 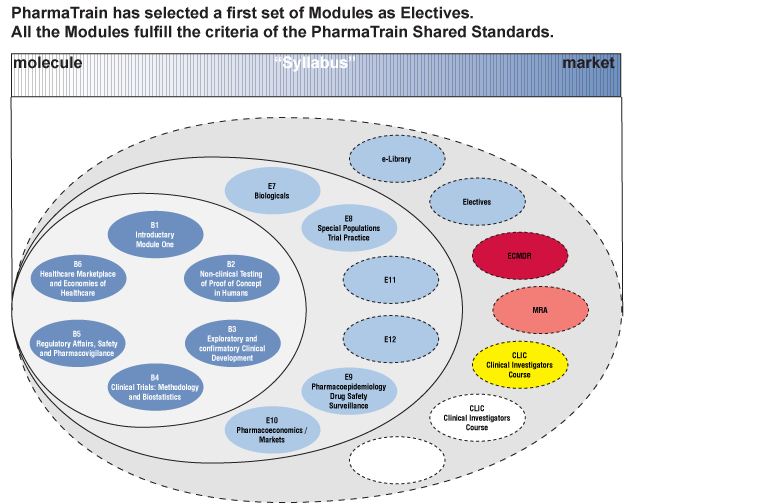 Diploma (Base) Courses and Master Programmes offered by the different Course Providers in PharmaTrain should adapt to the new PharmaTrain Shared Standards by April 2012. The “adaptation process” is called the “Implementation Process of Shared Standards”. The Implementation Process of Shared Standards is based on the concept of site visits of assessors at all course sites. If they feel prepared Course providers “call” the assessors trio teams for either a coaching or an assessment to, finally, achieve the Award as a Centre Recognition or directly a Centre of Excellence. Base Course and/or Master Programme teaching on the basis of the PharmaTrain Syllabus and implementation of the defined Learning Outcomes (LO). The 9 Cross Project Quality Criteria have to be in place.The understanding is that not all 180 topics of the Syllabus have to be taught face to face because this is not possible due to time reasons but they can be dealt with in assignments. Course providers have to show that all LO are met. Modular System based on the PharmaTrain Curriculum there is place for local flexibility. Enhanced Quality Management System (inclusion of assignments, openness to implement a quality management system), open to inspections. If a Course Provider wants to directly achieve the Award “PharmaTrain Centre of Excellence” the assessors have to agree that the criteria for a Centre Recognition are fully met and that at least two Elective modules or additional training programmes from our project are available. In addition the course provider should offer at least two Electives, i.e. two programmes which have been defined in terms of Learning Outcomes by WP3 (Lead: Peter Stonier). To achieve these PharmaTrain stamps course providers shall call for coaching and assessments. Teams put together of three persons from PharmaTrain ExBo, WP8 and IFAPP national member organizations (nMAs) will assess course providers onsite in an SOP guided process. All Centres of Excellence are found here. The four IMI Education and Training projects (EMTRAIN, PharmaTrain, SafeSciMET and Eu2P have convened a Cross Project Task Force on Course Quality led by Heinrich Klech from the Vienna School of Clinical Research, Vienna, Austria. The projects have agreed on a joint understanding and recommends a set of principles and criteria to develop a framework for quality assessment of the courses in December 2010, which are listed below. University accreditation OR a suitable system for approving, monitoring and reviewing the training offered. A system for quality assurance of teaching staff. The facilities, infrastructure, leadership and competences available for the support of student learning should be adequate, appropriate and up to date for the training offered. 7. Assessment of the students' achievement in accordance with the agreed learning outcomes of the training offered. 8. A system for collecting, assessing and addressing feedback from learners, teachers, technical/administrative staff and programme/course/module managers.